We may not be able to help with single MP3 downloads, but Books on First does still sell a CD or two (and we can order Mp3 music albums and audiobooks for you). 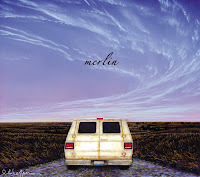 We currently have Merlin's new album "Freddy Garcia's Van" (I thought it was named "merlin," but that shows how much I know about the van, which apparently needed no introduction) at cost -- $7. If you were able to catch them at our place a couple of weekends ago, you would have heard a really together band, with some great original music as well as covers of Neil Young, Pink Floyd and the Grateful Dead, among many. Last Saturday was an incredible treat. Playing at Books on First was The Ronald Reagan Swing Jazz Band, a newly formed quartet featuring Kathy Cecchetti on vocals. She sang many standards like "It's a Wonderful World," "Route 66," "Dream a Little Dream," and "Summertime," that had patrons young and old humming, swaying, toe-tapping and even doing a little dancing (for which our new maple flooring is imminently suitable). She recognized people's need to sing along with old favorites and invited the audience to do so on several occasions. After we were able to close and clean up, we went to Tipsy, which is the Burketts' new drinking establishment down the hill on Hennepin (was once Linda Burkett's Stuff and then, leased to a couple of young men both named Ryan who opened Rhino's as Dixon's first smoke-free bar) to listen to a set of Wrong Element. They will be playing at Books on First on 20 Feb, although probably not quite the hard-edged rock-n-roll of Tipsy at 10pm. This coming Saturday, we have Corey Booth making his Books on First debut. He is a Brenda pick, probably heard at Tipsy's when he played there in December! We are absolutely looking forward to this. Remember, the live music starts at 7pm and goes until we close at 9pm. This works out perfectly for yours truly, who sets up the West Wing before I leave for NIA class at 5:30pm with Nichole Miller at Traditional Wellness Center (upstairs from Touch of Thai) and then, returns an hour later to change and help with beverage orders as people come in. For more information on all of our live music schedule, check out Books on First website.